Saloca in Wonderland: #AtoZChallenge: Green Tea face mask! #AtoZChallenge: Green Tea face mask! There's something really therapeutic about making your own beauty products. It's like cooking or baking from scratch, you never feel guilty about having a second helping because you know exactly what's in it. Homemade face masks are the perfect thing to start practicing if you want to make some homemade beauty products. We all know green tea is ridiculously good for us. Anyone who knows me online and in reality will tell you how much I bang on about how great green tea is, it's an elixir! Packed with inside and outside loving vitamins and nutrients, it's been on the superfood list for sometime now, packed full of anti oxidants and free radicals. Add to green tea the magic that is honey; it's an anti-inflammatory, bacteria killing, skin healing, moisturising, oil controlling, dirt pulling beast. 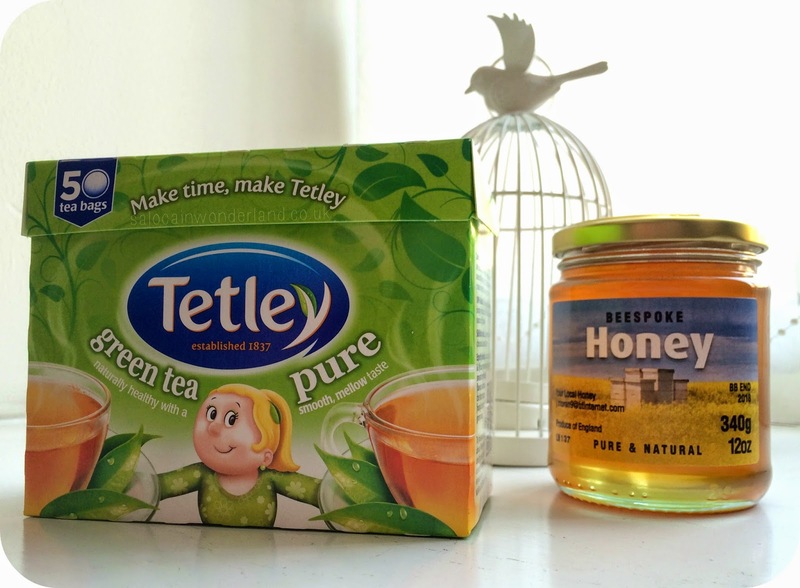 Green tea and honey are a natural acne fighting, skin loving duo! Consuming them is great and all, but using them together as a combined, topical treatment can really help to soothe breakouts, control oil production and restore balance to your skin. And it couldn't be more simple! Green tea and honey face mask for acne! Brew yourself a mug of green tea (let's get the internal and external benefits at once!). After steeping the tea bag for a few minutes take it out and put it to one side to cool slightly. Once it's cool enough to handle, carefully cut the tea bag and put the leaves onto a small plate or bowl. To the leaves, add a teaspoon of honey and mix. Use the back of a fork and work the honey and leaves together until well mixed. Using clean hands, apply to freshly cleansed, dry skin. Apply a thin layer topically to the acne affected areas. Sit back, drink your tea and relax for 10-20 minutes. Remove with a hot cloth, splash your face with cold water to close the pores and you're done! Quick, simple and tasty! Apply 1 - 2 times a week and you should notice a reduction in inflammation, oil production and clearer pores. Have you ever made a homemade face mask? Any you could suggest? I'm so confused! What comments haven't got through??! !